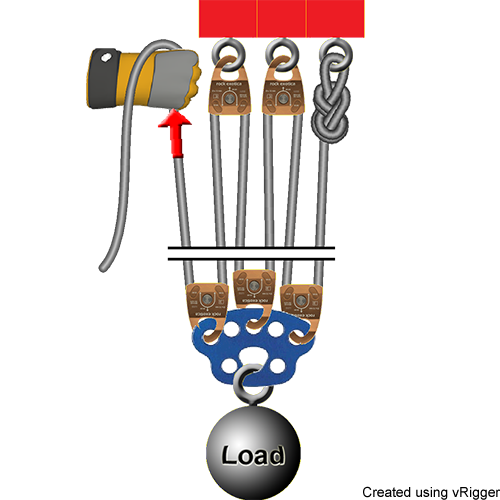 Although used less frequently, 6:1 mechanical advantage systems can be rigged as either simple or compound systems. Simple 6:1 systems are not very practical, because they require five pulleys. Compound 6:1 systems are easy to rig if you already know how to rig 2:1 and 3:1 systems. Refer to the overview on raising systems to learn more about mechanical advantage systems. A simple 6:1 has a lot of pulleys, but this illustration is worthwhile as an education tool. 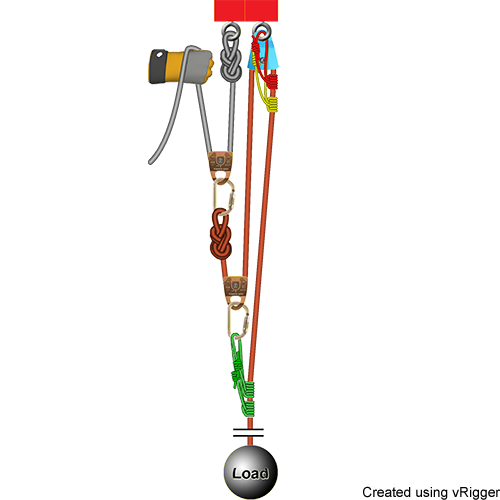 Remember that in "even" numbered systems (e.g., 2:1, 4:1, 6:1, etc) the end of the rope is connected to the anchor, as shown in this 6:1 system. By definition, compound systems have one simple system connected to another simple system. In this 6:1 we've connected a 2:1 system (gray rope) onto a 3:1 system (orange rope). When systems are stacked like this, you calculate the combined mechanical advantage by multiplying. For example, a 2:1 system combined with a 3:1 system is a 6:1 system. 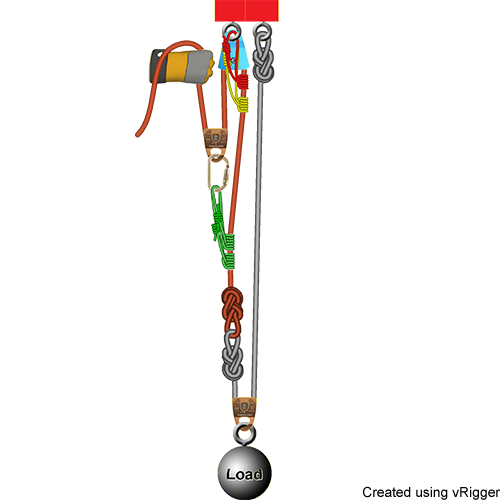 You could also create a compound 6:1 system by connecting a 3:1 system (orange rope) onto a 2:1 system (gray rope).